It’s been another weird week in retail. A poop-shaped children’s toy ruffled Louis Vuitton’s feathers, Trump’s contradictory tweets can now be found on flip-flops and cargo pants are making a comeback in 2019. This, and more, in this week’s retail therapy. The wide array of weird kids toys were on full display this holiday season with everything from Doggie Doo (self-described as “The Famous Dog Poop Game”) to Cubcoats (which are essentially wearable stuffed animals). However, it took just one toy to scare the crap out of Louis Vuitton. MGA Entertainment Inc, maker of the infamous L.O.L Surprise! and Bratz dolls, released a new toy in their Poopsie Slime Surprise line of products called Pooey Puitton. Although the toy purse is poop shaped and filled with slime-making materials, it’s the name and markings on the bag that upset the luxury designer, who later filed a complaint against the California toy maker. My daughters latest acquisition The Poopsie “Pooey Puitton” Unicorn Poop. MGA fired back, according to Reuters, claiming the product was parody protected and that no reasonable consumer would confuse it with the real thing. We wish that was undeniably obvious, but in addition to making the classic Neverfull, Louis Vuitton also suffered through heavy fashion misses like the New Age Traveler Backpack (adorned with all of the spiral telephone cords and tassels you could imagine) and the Raindrop Besace, which is essentially a $1,960 trash bag. Somehow, a poop emoji handbag doesn’t seem so unreasonable anymore. Maybe this really isn’t about customers getting confused. Maybe Louis Vuitton is really just upset that they didn’t think of the design first. It’s never a good idea to talk about politics at large gatherings with the extended family (trust us on this one), so let these flip-flops do all the talking. 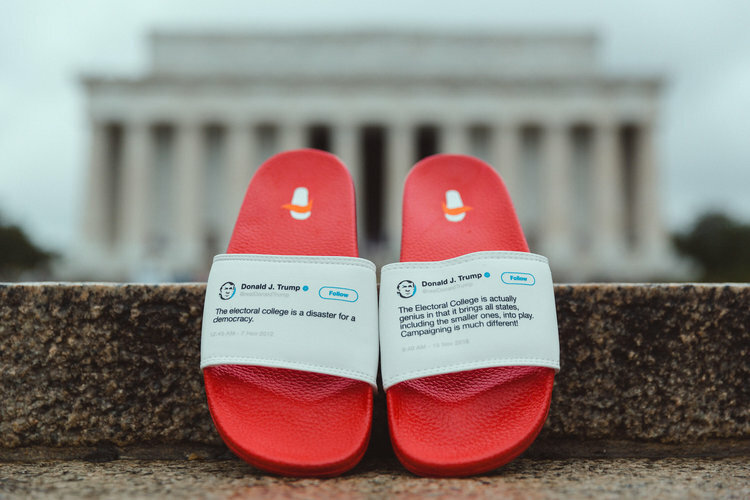 Sam Morrison, a photographer and artist in LA, created flip-flops that feature contradictory tweets from President Trump. Go ahead and resurface those tweets, Morrison. We’re here for it. And while we admit that these flip-flops aren’t necessarily the best accessory to tout at next year’s holiday party, it likely won’t ruin the celebration. But Trump himself might. Remember how magical Christmas was when you were a kid — going to bed early only to sleep with one eye open to try to catch a glimpse of the big man in red, then racing downstairs to see presents cascading under the tree? Well, that magic was almost taken away from a 7-year-old on Christmas Eve when President Trump was answering the phone lines for the NORAD Santa tracker. Sorry, but since when has it been essential to have pockets going down the sides of your legs? What are you carrying? Where are you going? Are you preparing for a “Bird Box”-style apocalypse? Honestly, people may want to blindfold their eyes to avoid looking at the monster that is these pants — starting with this $70 pair from Asos. 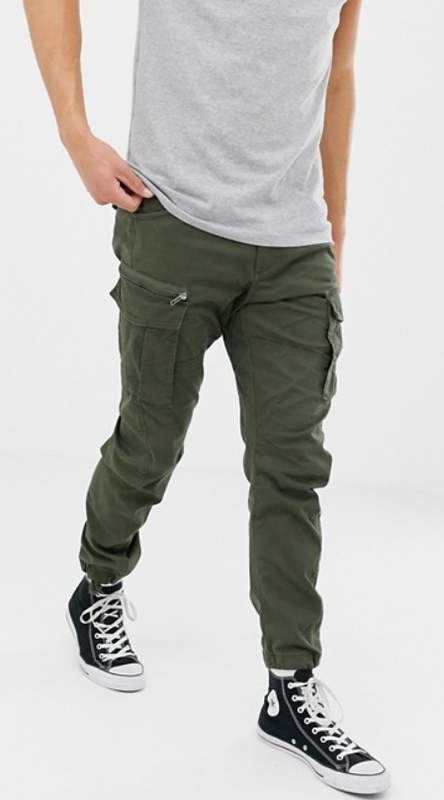 Cargo pants are basically just dad leg purses. But maybe Netflix was onto something with the timing of the film release, which amassed 45 million viewers in the first seven days, because Elle predicts feather accessories will also make a big appearance this year. Hm. Our prediction for the next big fashion trend? Blindfolds. People are no longer scavenging to find the perfect mini backpack that fits a phone and wallet, max — if that. 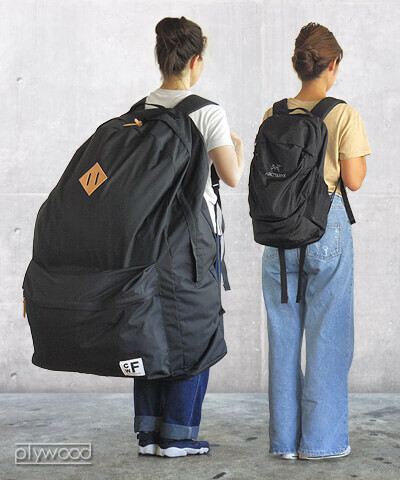 But the backpack trend is far from over, and thanks to CWF, consumers can buy a bag big enough to fit everything. Literally, it could fit everything you own, and maybe your dog, too. OK, sure, try explaining that to any practicing chiropractor in existence.